Vermont High School "Yellow Jackets"
Vermont (population 792) is located in western Illinois in southwestern Fulton County. Vermont is situated about 18 miles southeast of Macomb (as the crow flies). According to the website http://www.outfitters.com/illinois/fulton/vermont/vistige.html, Vermont was settled and established as early as 1835.One of its early settlers named it after his home state of Vermont. 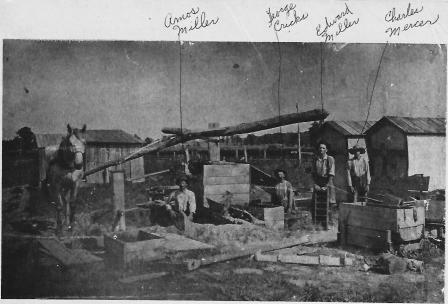 The town gained great early support as a meat processing location. 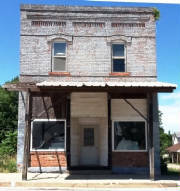 It was bolstered by the addition of two railroad lines which laid tracks through town in the early 1870's. The town is known for its excellent architecture and well-built houses. Steam Engine Traveling Through Vermont - 1800s? "The photo was taken at Vermont's 8th street crossing, northbound train towards Galesburg. Johnson Elevator in background. Doubleheaded, with a Roger's built 4-6-0 trailing." The cargo on the train includes horse-drawn wagons. Progress did not ultimately shine well upon Vermont. As major roadways were laid in the western part of Illinois, it seemed Vermont was just far enough off of the beaten path to not warrant one of the three U.S. Routes (67, 136, and 24) that pass within a few miles of its west, north, and south sides respectively. The two county roads that pass through Vermont are County Roads 36 and 13. The AT & SF Railroad now owns both sets of tracks in town. The Otter Creek and Sugar Creek both flow through the area. "As I understand it--prior to 1905 Vermont was divided into two school districts--North and South. 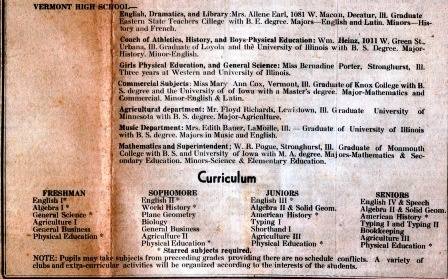 In the 1880s the North District had a larger enrollment. Ten years later the South District outgrew the North. South School: Had three rooms containing three grades each plus the High School with a four-year course. North School: Primary and Intermediate room each with three grades and a High School offering a two-year course, plus the 7th and 8th grades. 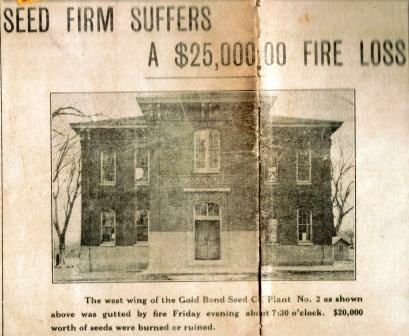 1905: Voted to consolidate North and South, couldn't afford a new central building. 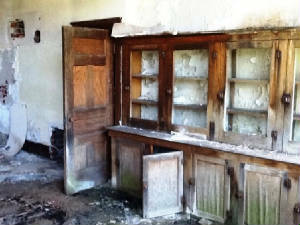 Primary rooms were left in South and North Schools. High School plus 3rd and 4th grades were placed in South School Bldg. North School has 5th, 6th, 7th and 8th. Accredited by Uof I in 1910. 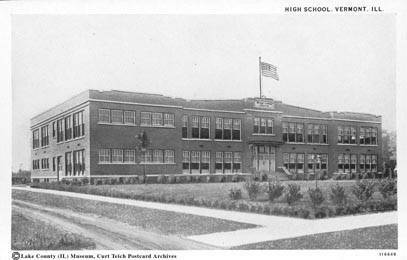 1924: A new central HS was built." 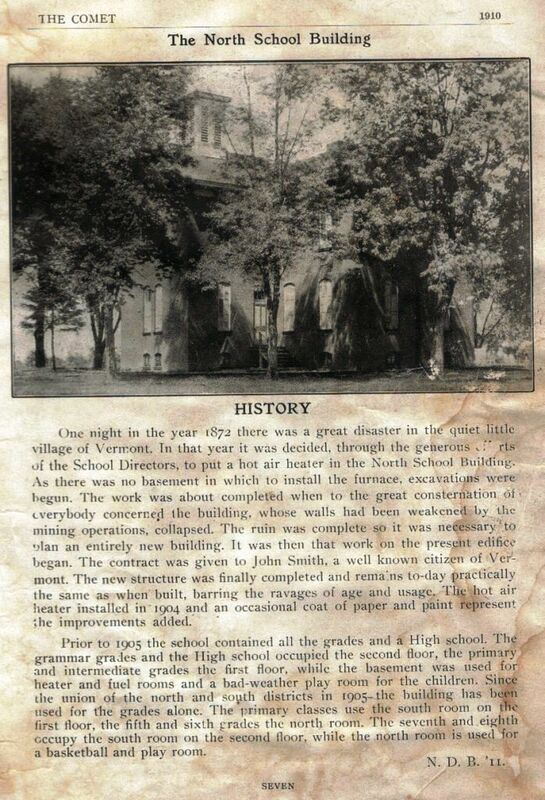 "In 1923, a decision was made to build a new school building for the Vermont community. Thirty tousand dollars had been saved by the school board for such a purpose, and it is estimated that when completed the building and equipment cost about $85,000. Harvey Brinton supervised the masonary work on the building and Fred Rankin the carpentry work. A distinctive feature of the interior design of the building was the gymnasium on the gournd floor level, enclosed on three sides by the balance of the building with passageways affording access to the rooms in the school and also providing the space for spectators and creating a balcony at the second floor level. 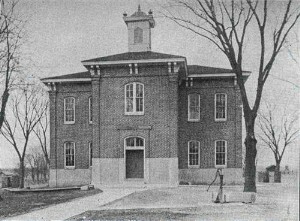 The building accepted its first classes for the fall term in 1925, and continued through the spring of 1948 as the Vermont Community School. Thereafter it served through the spring of 1977 as the Vermont Grade School building, and for a time accepted some students from Table Grove before the V.I.T. Jr./Sr. High School building opened in 1958. 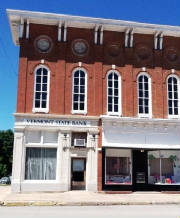 The consolidated Vermont, Ipava, Table Grove Unit District #2, formed in 1948, sold the building when it was no longer used for a school, and it is presently owned by Roberta Queen, and houses her antique shop, Queen's Schoolhouse, as well as another enterprise, the Outback, owned by John and Sandra (Douglas) Bybee of rural Vermont." As the short article states, the late 1940's brought the pressure of consolidation to the towns of Vermont, Ipava, and Table Grove. In 1948, the three towns agreed to consolidate their efforts and created the Vermont-Ipava-Table Grove (V.I.T.) School District. The schools for the District are now located in a country setting near Table Grove. www.rootsweb.com - Fulton County, Il. This year’s school was marked by some great improvements upon the schoolhouse. As a new building could not be obtained, it was thought best to remodel the old one. Consequently, changes were made both inside and out. 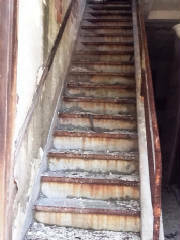 The stairs were rebuilt, and now lie so that they may be more quickly descended in case of fire, and also afford more room in the halls. New desks were installed in the primary room. But the greatest change is seen upon the exterior of the building. 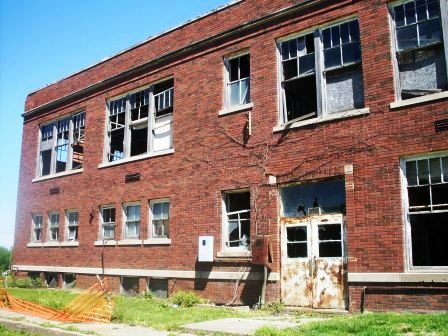 The walls were treated to a coat of brick-red paint, and were covered with cement work to a height of six feet from the ground. Concrete walks were also laid in place of the wooden ones. The building now has the appearance of being new." 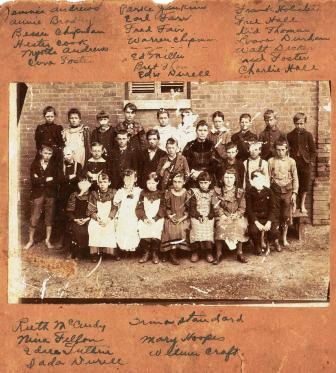 The photos below were submitted to us by John Bybee and John Marshall and include some more history information regarding the very early Vermont School system. 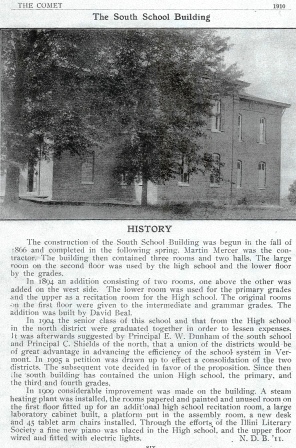 The Vermont High School building pictured at the top of this page served many purposes after its closure as a school. It was once a fall-out shelter in the case of a nuclear attack in the 1970s. It also served as a skating rink with concession stand in the 1980s and as an antique store as late as the 1990s. 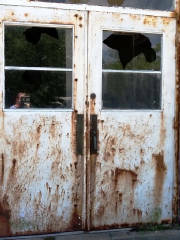 After the occupants left however, the school slowly began to deteriorate. 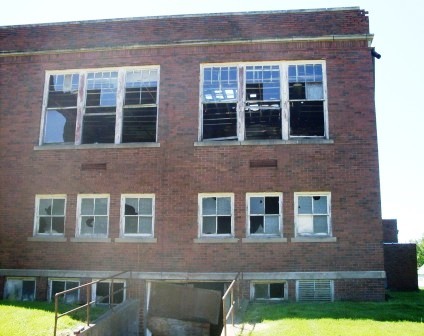 In 2011 the school was destroyed by fire and is not longer standing. DID YOU KNOW: One famous "resident" of the town's cemetery is the Ringling Brothers Circus' own Leo the Lion, who died while the circus was performing there in the late 1800's. Leo is buried there with his grave marked by its own tombstone. 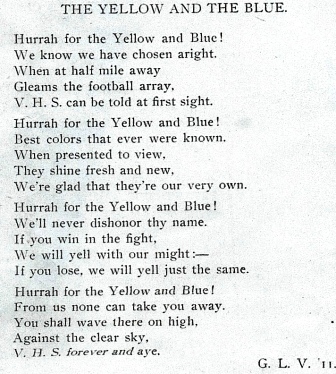 School Fight Song: "Vermont High School Loyalty"
We’re loyal to you Vermont High!! Vermont High School offered boys basketball and boys track & field. It is probable that baseball was offered as well. The basketball and track programs had a measure of success listed on the IHSA website www.ihsa.org. We are curious if the school had a nickname. What were the school colors, conference affiliation, and other accomplishments of Vermont High? These are being sought as well. 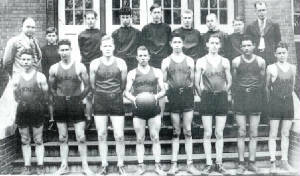 The boys basketball team won two District titles in the late 1930s. Unfortunately very little information is available on them. 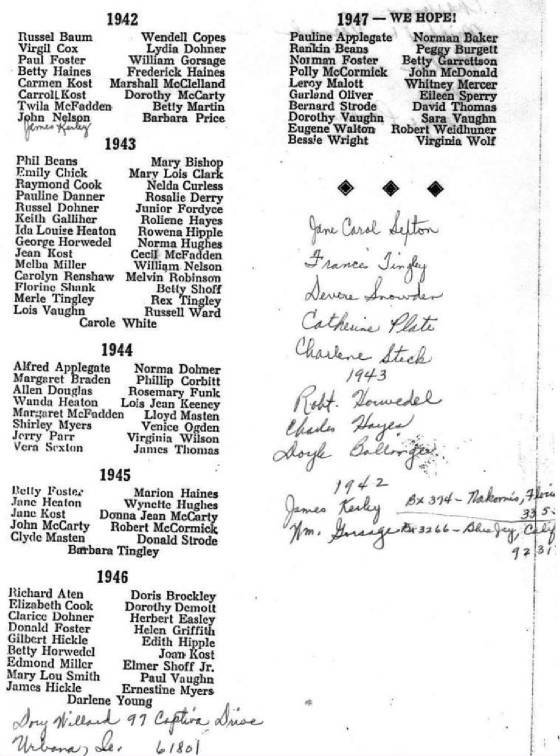 We are searching for the coach's names and team records of these and other great Vermont teams of the school's storied past. 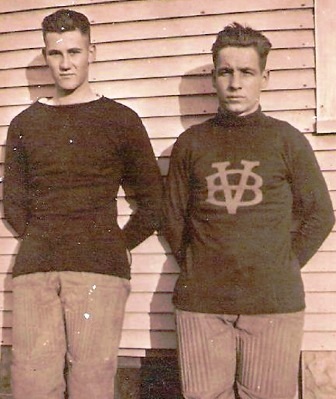 The caption under the above photo reads: "With the basketball team in the late 1920's is Hobart Engle on the left, the principal at the School, and Clifford C. Mercer, the coach on the right. 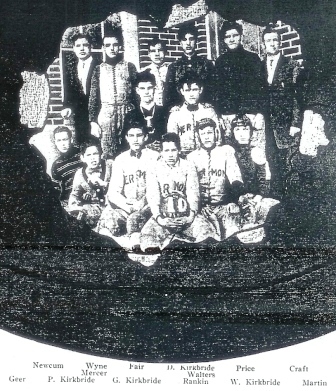 The basketball team is identified by the surnames of the members. 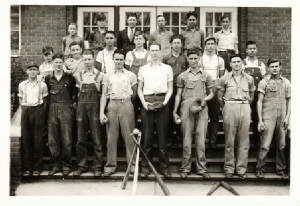 First row, left to right: Fry, Smith, Marshall, Crouse, Bader, Corbitt, Farr, and Corbitt; back row: Geer, Nielsen, Kost, Miles, McCLelland, Harris, and McDonald." Several scores involving the Vermont High School boys basketball team playing in the IHSA State Tournament were located on a website titled "Illinois Postseason Basketball Scores." These scores are posted below. 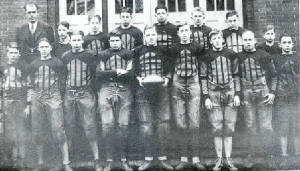 1922-23 through 1932-33 Postseason scores, records, and coach's names needed. **Final basketball game as Vermont High School, became part of Table Grove V.I.T. 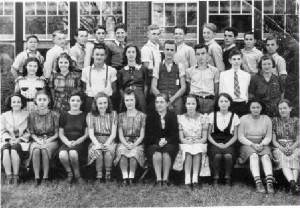 High School in the summer of 1947. One Vermont trackster brought home some pride and excitement for his classmates from the IHSA State Track Meet. Carroll Rankin took third place honors in the long jump in 1907. This was accomplished in the one-class system in Illinois at the time! Carroll Rankin can be viewed in the photo below. 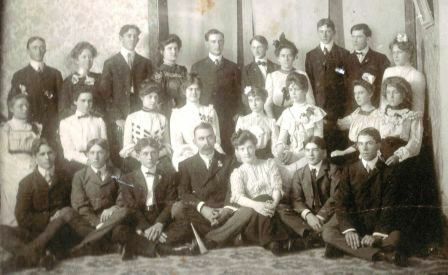 He is in the back row, third from the right. The photo was submitted by Vermont resident John Bybee who also tells us that the American Legion Post #26 is named after Carroll Rankin as he was killed in action in World War I. 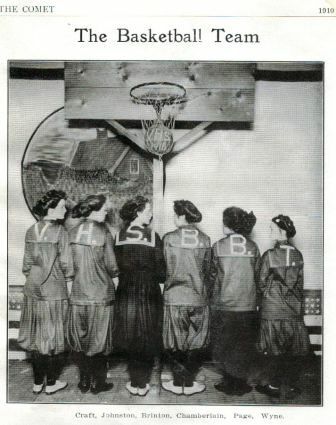 Yes, the Vermont High School girls completed in basketball as well. 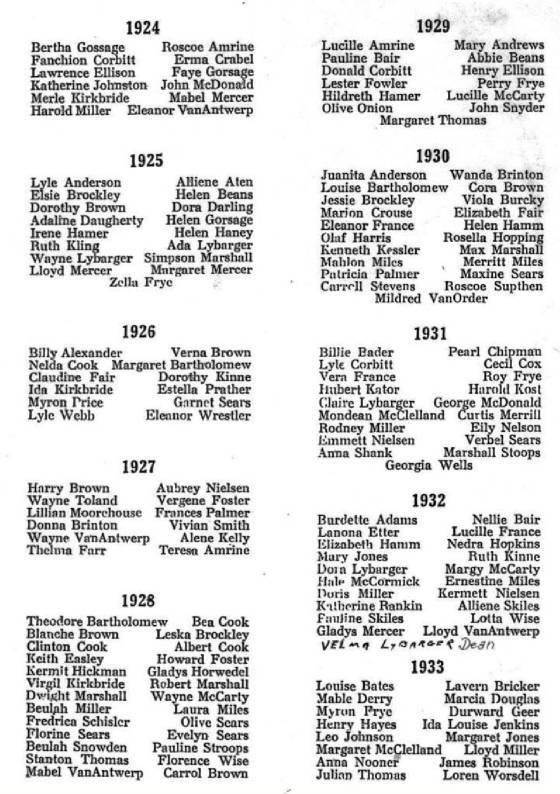 Most high schools in Illinois had girls basketball teams in the very early 1900s. But the Illinois High School Athletic Association (IHSAA), the governing body for the public high schools, had taken a dim view of girls athletics, other than for intramural sports, prohibiting member schools from having a girls team play against another school. This ban became effective in 1908, but was not widely known or enforced. Some high schools which came along in the early 20th Century would organize girls teams without realizing they were violating IHSAA rules. The photo below was sent to us by John Bybee. "Only one game of basketball was played this year, being defeated in that. Failure was due to lack of practice. Hardly enough girls turned out to make one team, and therefore it was impossible to practice to any benefit. The team did not receive support of the students it should have." The boys competed in football too. 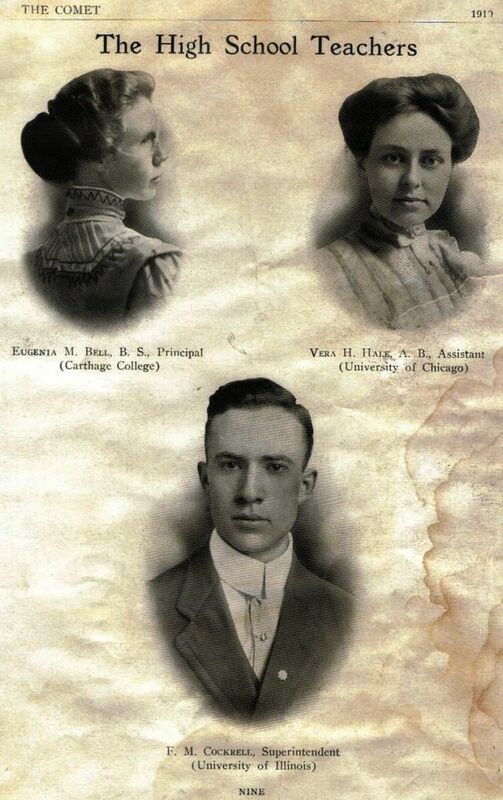 This photo is from the 1909-10 Vermont HS yearbook called "The Comet". No results from this season were available however. "Foot ball could hardly be called a success this year. In fact, it was a discouragement. THere was as good material in the school for a first class team as there has been. However, many were prohibited from playing because of parental objections, and several would not practice. THe result was that the men practiced for a time, then the number dwindled down until there were not enough left to compose a team. Only two games were played during the season, with the city team, resulting in a tie, 0 - 0, and with Table Grove, score 9 - 5 in our favor." 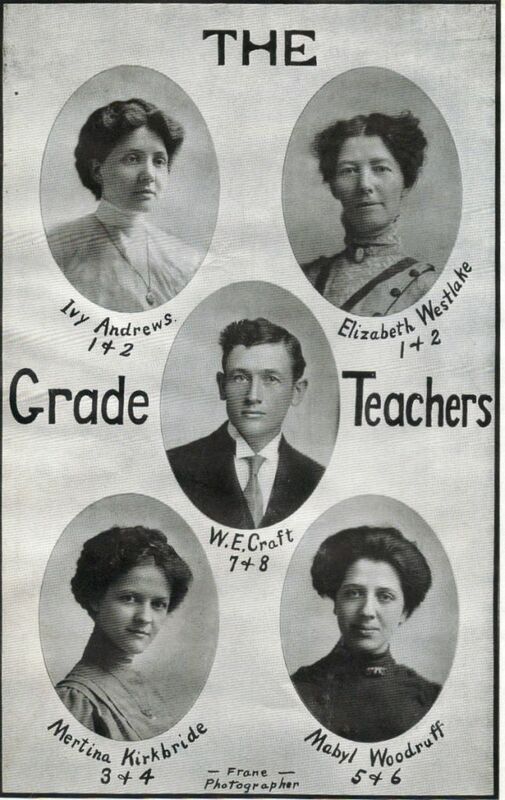 From the 1910-11 Vermont HS yearbook...must have been a lot of controversy that year! 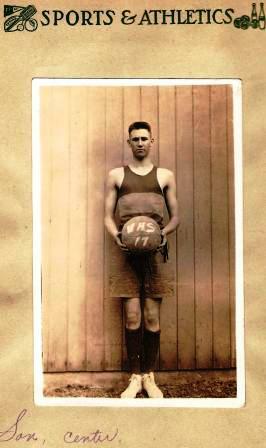 As far back as 1896 Vermont High School is remembered as a great athletic center. In all athletics, base ball, foot ball, and track, they had no superior and hardly an equal. They played Glaesburg, Canton, Lewistown, Bushnell, Macomb, and all of the larger towns and for several years knew not what the word defeat meant. For three years in succession they won the Fulton County athletic banners and also the relay cup. Those were glorious old days for V.H.S., but look at us now. We are not as strong in athletics as we used to be, but we have material. We now the ancient saying, "Practice makes perfect," and we are going to practice. We will never be perfect, we know, but we have school spirit and will try. Watch us." "This photograph taken in front of the front entrance to the new Vermont Community School building shows the fooltball team ready for play in the late 1920's." The boys fielded a team on the baseball diamond as well. Results for each season are being sought. 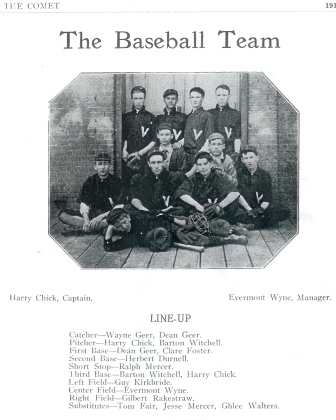 "The base ball team has made a good record this spring. Out of the six games played, five have been won, giving a percentage of 833.30. Prospects for a winning team next year are bright, as the lineup, with the exception of one or two, will be the same. Players: Dean Geer, Guy Kirkbride, Ralph Mercer, D. Kirkbride, W. Wyne, Herbert Durcell, Tom Fair, W. Geer, Ghlee Walters, Verne Price. Beat Astoria 21 - 11"
"I read in a ’47 Vermont HS Yearbook that the football team’s nickname was the Crusaders while the basketball team was called the Yellow Jackets! 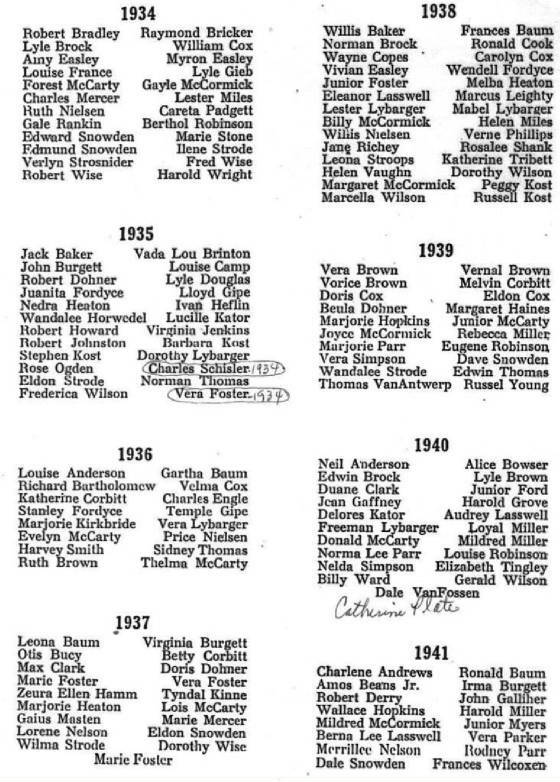 This was the last year for the Vermont HS as the VIT consolidation began in the fall of ’47." 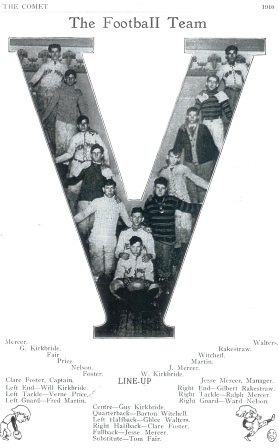 "Bob Barrett designed the winning "VIT" athletic letter in 1948. There were numerous designs and all of them took up too much space. He logically remembered that the single letters were easy to apply and did not take up much space. He used the “V” as a solid base or foundation, capped it with the “T” which made the triangular symmetry complete, and the only place the Ipava “I” could be seen was on top of the stack in front." "(Regarding the schooll building fire ) I knew that several dozen books went up in the flames. One of them was a 1950s "Speak to the Earth" about geology and oil exploration. I tried to strike a deal with the then owner of the VHS, Bobbie Queen. She had an auction and moved back to CA. in the early 1990s. The books stayed behind, guess I should have just "liberated" the volume afterwards. 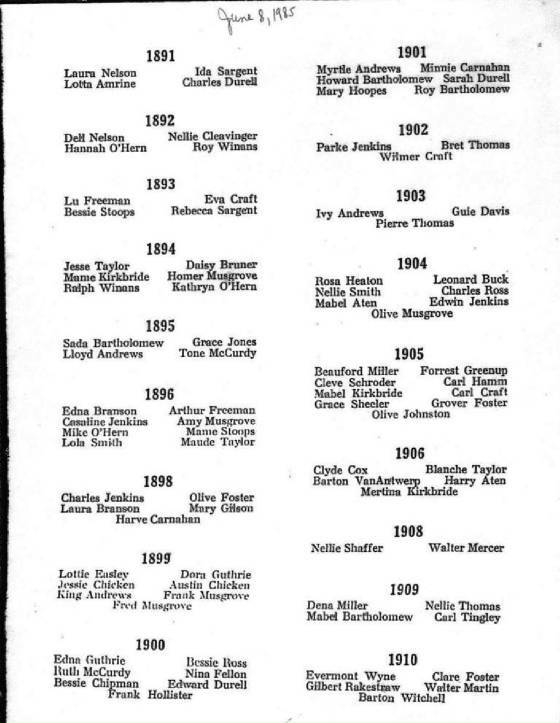 I think the last stage productions were in around 1958/59 when a trio of singers from Chgo--"The Three Twins" presented a program. Alan Douglas was one of the singers and originally from Vermont and my wife's uncle. In about the fall of 1970 or so, Chuck Wickwire and I attended a talk and film presented by an USAF officer from NORAD on the subject of a Soviet nuke attack.. The school at that time was a designated fallout shelter. I still have one of the empty 50 gallon olive drab barrels that once held Civil Defense rations. CD stored a large quantity of food and water in the basement of the school. I think I have a play bill for the stage in the 1930s." 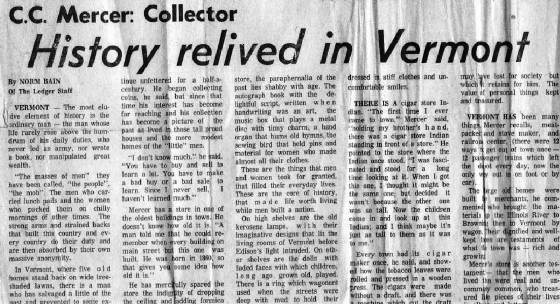 "Clifford C. Mercer "Eph" was a coach and teacher at the old VHS in the 1930s etc. I well remember his store. Back in 1959, when I was 10, I would go into his store to buy comic books. To me the store was erie, dark, dank, and Eph was beyond old. I spent my dime for Sgt. Rock comics and got out fast. Eph died in 1977 and there was something like 12 hay wagon loads of his antiques sold at auction. His son Whitney and I still talk VT history on occassion." 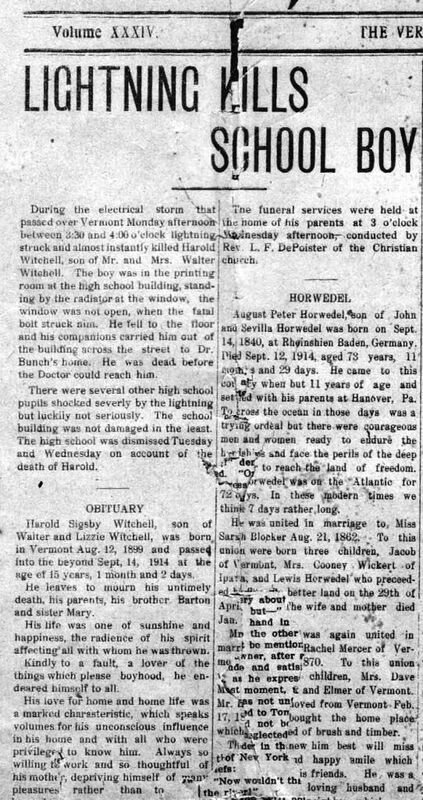 One hundred and seven summers ago, Friday, August 11, 1905 was a day of evil in Vermont, Illinois. Two of the village’s citizens—one a young schoolteacher, the second a middle-aged storekeeper-- both died violent deaths within the same hour. Miss Minnie Carnahan was born in Vermont on May 18, 1884 to William Fielder and Sarah “Sally” Ann (Webster) Carnahan. Fielder was a black-haired, black-eyed veteran of the Civil War. He had been a blacksmith in his younger years, but was now a poultry dealer. The Carnahans maintained a modest home in the south part of the village. Minnie was the youngest child. Her older siblings being Alma D. (1871), Angeline (1873), Maud (1876), and Harvey (1879). Minnie was of a quiet disposition and devout. 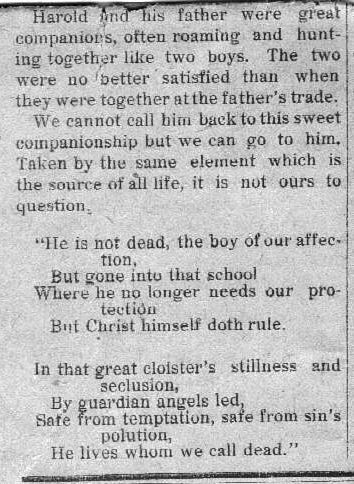 In September 1903 she united with the Vermont Christian Church. Minnie in the spring of 1904 taught school near Lewistown. In April of 1905, she became ill and consulted Vermont’s Dr. C.H. Hamilton. Minnie complained of spinal pain and attacks of blindness. She had no appetite and was quite nervous. 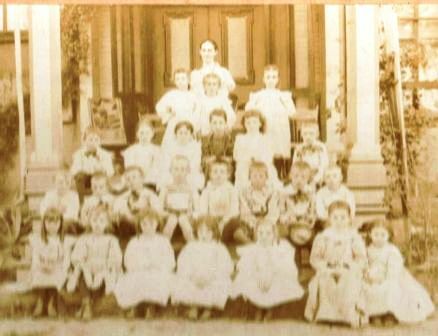 On Friday, August 4, 1905, Minnie was in Lewistown attending a summer school institute. A series of blinding headaches forced her to return to Vermont on the afternoon train. She did not sleep well Wednesday night August 9th and on Thursday she felt her mind was wrong and she again consulted with Dr. Hamilton in his 3rd Street Office. She questioned the doctor if he thought she was losing her mind. That night, Minnie’s mother noticed that Minnie was more confused and sicker than usual. Minnie went to bed at her regular time. Sally Carnahan looked in on her daughter at 1:30 A.M., and she appeared to be sleeping soundly. The Carnahan family awoke at 5:00 A.M. and discovered that Minnie was gone. Thinking perhaps that she may have sleepwalked the half-mile to the railroad trestle, which spanned the Vermont-Astoria Road, Richard Alexander, her ten-year-old nephew from Lewistown was dispatched south to the railroad. Minnie’s brother-in-law Charles Beaty headed north to search for her. C.B. & Q. engineer M.J. Steinmiller of Rushville was running engine #411 and bringing the morning passenger train to Vermont. Number 22 was due in Vermont at 5:35 A.M. but was behind schedule. At about 6:15 A.M. Steinmiller whistled for the station board about a mile west of Vermont. He notched the throttle back and drifted towards Vermont. A hundred yards ahead, Steinmiller saw an object on the track. He whistled but saw no response from the unknown shape. As the train closed the distance, he was startled to see the unknown object transform itself into a woman! Steinmiller whistled a series of short urgent shrieks of the whistle. The woman had her shoes off and appeared to be changing her hose. Steinmiller slammed the brake handle into emergency and again whistled. 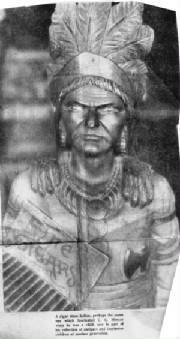 The woman rose to her feet and stared at the oncoming train. She still had plenty of time to get clear of the track, instead, she dropped and layed across the rails! Richard Alexander arrived on the east side of the trestle only seconds before the train came along. He could only stare helplessly as the train struck his prostrate cousin. 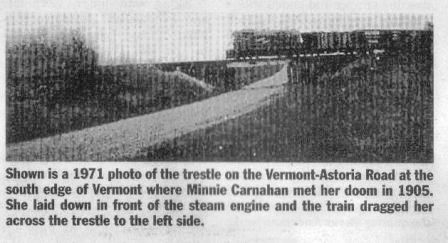 The sliding locomotive struck Minnie in the head and the entire train of engine, tender and three cars passed over her and carried her mangled body to the east side of the trestle. Steinmiller climbed down from his cab and tried to calm the distraught youth who was screaming, “You have killed my Aunt Minnie!” Minnie’s body was carried to the baggage car and the train proceeded to the Vermont Depot where station agent Ed Thomas took charge of the body. Thomas sent word of the tragedy to the Carnahan family and summoned by telegraph Coroner Zeigler from Canton. At the exact moment the Carnahan tragedy was occurring, Jesse Burr Witchell was eating breakfast. Burr’s health had been declining and he had not slept well Thursday night either. Born in Vermont on June 11, 1853 he was the eldest son of I.B. and Sarah Witchell. Burr had two brothers, John and Walter. Two sisters, Eva and Mrs. Adaline Branson. Burr left the family farm early and spent two years in Kansas. Burr was back in Vermont by 1885 and entered into a parternership with his uncle Hiram S. Thomas. The businessmen opened a book and stationary store on the west side of North Main. Two years later, Burr bought Hiram out. Burr served one term as Postmaster. He never married, said he never had the time. Friends and customers later recalled that he was more despondent in the summer. After his skimpy breakfast Burr stopped at the post office and opened his mail. He arrived at his store at about 6:30A.M. and swept the floor. Drayman Frank Van Antwerp had a consignment of merchandise for Burr. Frank pulled his team and wagon up in the front of Burr’s store and went inside. Frank saw nothing of Burr and went to the back door and looked out. Still no sign of Burr, Frank ducked back into the store and soon discovered Burr’s body hanging in a kneeling position by a small rope tied to the knob of a showcase, about four feet above the floor. Coroner Zeigler impaneled a six-man inquest jury headed by village marshal William Austin Fair. Zeigler conducted both inquests on Friday evening. On Saturday at 9:00 A.M. Christian Church Elder G.W. Ross presided at Minnie’s funeral, which was held at her home. After lunch, at 2:30 P.M. Elder Ross conducted services for Burr at the Branson home located in the two-story brick house at the corner of West Fifth and South Liberty; now known as the former Price and Midge Nielson home. Minnie and Burr slipped from this world to the next with hardly a whisper of memory. We struggle for a rationale that explains the chain of circumstances or events, which flooded over the vibrancy of Minnie’s youth and negated the middle-aged wisdom of Burr. "Sonny was a sports jock in HS days. He worked for a short time after graduation for the C.B.&Q RR section gang at Vermont. 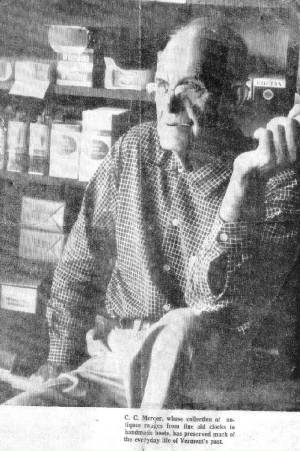 He ran a grocery store in Vermont for the majority of his adult life. I believe he was the town clerk etc. He always set next to the front window of his store in his later years, he had a heart attack and passed away there."